Catch a FREE PREVIEW of NFL SUNDAY TICKET Sept. 13th on DIRECTV! Experience the NFL like never before! 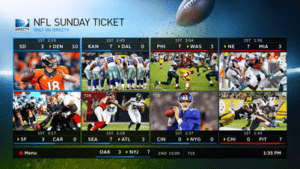 Kick off the 2015 season with a free preview of NFL SUNDAY TICKET on DIRECTV Sunday, September 13. Catch it all on channels 701–719. Watch up to eight lives games in HD at the same time on DIRECTV’s exclusive Mix Channel. Choose up to 20 players and keep tabs on their stats throughout the day with Player Tracker. Plus, get real-time scores, stats, and standings throughout game day right on your screen—all without missing a second of live game action. Enjoy your NFL SUNDAY TICKET free preview on Sunday, September 13, only on DIRECTV (Chs. 701–719). Dont Have DIRECTV for your Business or Home Yet?